A client's request for a turf edge to go along with his perimeter-overflow pool confronted Brian Van Bower with an unusual challenge -- and led to a solution that serves as the crowning touch for a project filled with watershapes from one side of the property to the other. Of all the design trends that have taken hold in watershaping through the past ten years, the one that leads us to work with plenty of slot-edge, perimeter-overflow systems may well be my favorite. I’ve done them partway and all the way around pools and spas; I’ve run them up against all sorts of materials, from poured concrete to incredibly beautiful varieties of stone; and, most of all, I’ve appreciated the skill that goes into installing them and making these water-in-transit effects work to perfection. A while back, however, I was asked by a client to border part of a pool with planted turf – in this case a hardy groundcover. My immediate response was “Why not?” before a whole list of practicalities began running through my mind. The project was being run by Rene Gonzales, a local architect who clearly loves water. In the front of the house, for example, he had us work on an entry defined by a pair of rain-style cascades that fall onto beach pebbles over a large collecting tank. We also designed a rill that runs through the house, with stepping stones set up at key crossways. And it’s all topped off by a large indoor Koi pond – a wondrous, ongoing source of fascination. Out back, however, is the sheltered courtyard in which we were asked to devise a perimeter-overflow vessels that was, as envisioned, to be partly bordered by turf. The home is a true water-lover’s paradise. It all starts out in front, where you encounter a long, two-level curtain of falling water that guides you to the home’s entrance. As you approach, you see long channels with stepping pads placed over the top at key crossings and intersections and ultimately come across a large, well-populated indoor Koi pond. To make it work, we decided we needed a simple sectional system of two-piece stainless steel plates, as shown in an illustration below: These were welded together at an angle that provided sufficient support for a turf edge overhanging the gutter system. Once on site, the assembled plates were welded together to keep anything from moving through gaps to contaminate the water as it flowed along the gutters. It was a laborious but relatively simple solution, and it provided a distinctly (and permanently) clean look when the soil and groundcover were put in place. 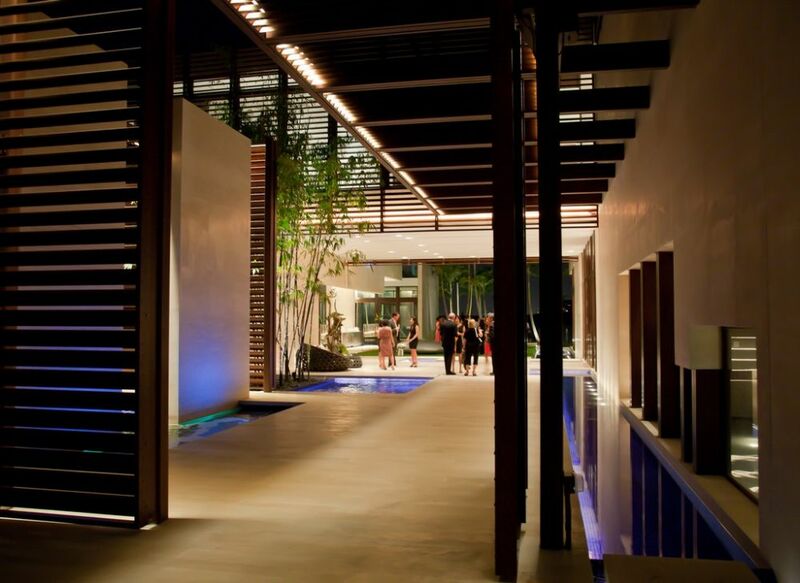 Beyond the entrance, you recognize that water distinctly defines the space. There are long channels and rills and small pools to examine, and you also hear the sound of a second rain curtain somewhere just beyond this very large, sociable space – the scale of which is clearly apparent when you see people in it. The rain curtain is freestanding this time to magnify the sound and sense of drama. You can carry off this look with a variety of slow-growing, low-profile, ultra-low-maintenance plants, but as a rule I would advise against going with regular grass: The fact that it needs mowing and sometimes aggressive maintenance gives me concern at the water’s edge, and I don’t care to think of all the debris and fertilizer that might find its way into the circulation system. Yes, it can be done, and we’ve used grasses several times in projects since completing this first one, but it requires unusual and long-term diligence! As for the pool itself, the drainage slots are an inch wide, and the flow is perfect around the full perimeter. As important, the edges of the steel plates are elevated a precise quarter-inch above the watershapes’ slots: This is enough to capture a very high percentage of the water that moves out of the pool when someone is swimming, for instance, and handles all but serious splash-out. The main pool is where the edge detail and a lot of creative energy came into play: The client wanted a hardy groundcover in the area overlooking open water, and we obliged by developing a system of angled plates (see the drawing at left) to support the turf above components of the perimeter-overflow system. The approach worked like a charm, but this is not a low-maintenance detail and there’s a definite level of care required to maintain the crispness of the look. There are lots of cool things about this project, but one of the most positive is what emerged on the manufacturing side: As you’ll see in the sidebar below, our work here led to conversations with Bobé Water & Fire Features (Phoenix, Ariz.) that have made gaining access to this grass-edge approach much easier and more efficient. This is another case in which a look that was becoming a bit familiar has been given a new and productive twist as the result of a client’s desire. Since completing this project, we’ve worked on several more perimeter-overflow systems where homeowners were looking for something different – and for whom a green-edged approach perfectly filled the bill. As is mentioned in the accompanying text, working with our first turf-edge system ultimately led to bigger and better things. The subject came up during one of my regular conversations with the team at Bobé Water & Fire Features (Phoenix, Ariz.), and they decided to have a go at turning our basic idea into a standard product. The original system was just two flat plates welded together into an open “V” shape. Bobé took that design and added support struts that significantly increase the structural rigidity of the system. Even better, they added a black, rubberized cap that fits over the top, exposed ends of the panels, keeping bathers away from hard and potentially sharp edges while making the tops of the panels vanish into the background. The project seen here – the first in which the new prefabricated system was applied – was completed by Paragon Pools (Houston, Texas) in following our design. 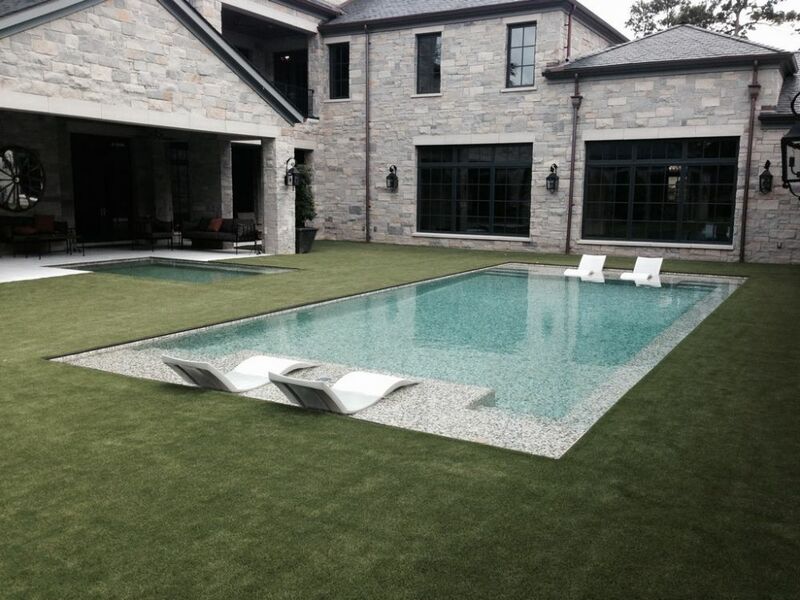 In this case (and as can be seen in the images included as part of this sidebar), they used artificial grass around the full perimeter of the pool and most of the perimeter of the detached spa, producing just the sort of clean, architectural look the client wanted. Since then, Bobé Water & Fire Features has made these panels available to all comers in ten-foot sections for which they’ve developed a watertight joining system. For shapelier projects, they can also custom-contour the system to fit any radius. As with all perimeter-overflow watershapes, these called for ambition on the part of the client. They also require us at Aquatic Consultants to be precise in our designs, complete in our documentation and serious about top-flight hydraulics and engineering. The best thing about these systems is that they seem so effortless when done well; the worst thing is that actually achieving this appearance of effortlessness takes a whole lot of thought and preparation that translates to lots of precision work for a quality-minded builder. It all came together here, thank goodness. Life is good.